The Pinnacle Rinseless Quick Wash & Detail Kit has everything you need to clean your vehicle virtually anywhere. 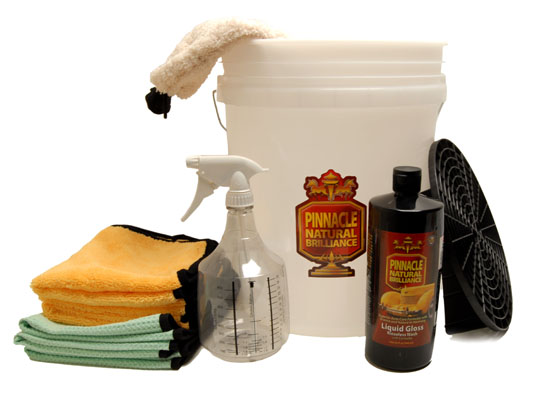 This kit features the cleaning power of Pinnacle Liquid Gloss Rinseless Wash with Carnauba which is perfect for keeping or vehicle clean no matter what type of water restrictions you may face. The Pinnacle Rinseless Quick Wash & Detail Kit also includes the tools and towels to get the job done right! Give your automobile Pinnacle's trademark wet shine each time you wash it with Pinnacle Liquid Gloss Rinseless Wash with Carnauba. Pinnacle has a proud tradition of creating dazzling wet paint finishes using the finest blend of ivory carnauba waxes. Pinnacle Liquid Gloss Rinseless Wash with Carnauba is formulated with the purest grade carnauba wax to clean, protect, and shine your automobile in one easy step. This ultra-high lubricity formula floats dirt and grit off of the surface without scratching. The premium Pinnacle carnauba wax imparts a deep, shimmering shine that dances across your body work. Pinnacle Rinseless Wash with Carnauba is the quick and safe way for connoisseurs to care for their automobiles. Use the 5 Gallon Professional Wash Bucket with a Grit Guard Insert to protect your RV from scratch-causing grit. It does more for your vehicle than an ordinary wash bucket! Every detailer needs a Professional 5 Gallon Car Wash Bucket. This large bucket is perfect for washing cars of all sizes. The wide mouth accommodates most wash brushes and tools. The Grit Guard has a radial grid surface that scrapes dirt out of your mitt or sponge. Four quadrants at the base of the Grit Guard calm the wash water and hold the grid above the bottom of the bucket. Dirt falls to the bottom and stays there. The raised radial surface fits in the bottom of any 5 gallon bucket and extracts grit from your wash mitt or sponge when you drag it across the Grit Guard. The 36 Ounce Detail Bottle is perfect for the enthusiast or professional who purchases their detailing supplies in bulk. Constructed of extremely durable PVC, the 36 Ounce Detail Bottle can handle serious cleaners and acids. The clear construction and graduated measuring labels, in both standard and metric increments, make it easy to measure your favorite chemicals precisely. If you need to dilute your chemicals a dilution ration chart is also clearly labeled. The included heavy-duty, chemical-resistant sprayer is adjustable from a fine mist to a powerful stream. The Supreme Guzzler Waffle Weave Drying Towel features a plush, 80/20 waffle weave that increases its surface area for greater moisture absorption. The towel can absorb 7 times its own weight in water! It's a terrific drying towel for any size vehicle. This kit has a total retail value of $117.93 saving you $37.94!